CASA Palooza 2019 is slated for April 26th at Sylvan Cellars Event Center in Rome City. This event is our annual fundraiser that features food, drinks and silent auction items with proceeds directly benefiting Northeastern Indiana CASA. Last year, with the support and help of generous community members, sponsors, volunteers and business, we raised $52,500! We are looking forward to another amazing event. Stay tuned for more details and ticket information. Get all the event details as the unfold at http://www.neincasa.net/casa-palooza-2019. Want to know when tickets become available? Sign up to get an email notification! ALBION – To be effective, volunteers must be effectively trained. This is the motivation for several upcoming training sessions offered to volunteers serving Northeastern Indiana CASA. Training dates will be held on several dates in January. Beginning Monday, January 14th, sessions will also be held Wednesday, January 16th and Friday, January 18th. “New volunteers and any current volunteers that feel they need a refresher course can participate in any two days of training,” said Executive Director Kirby Cool. Additional training is being offered Tuesday, January 22nd and Thursday, January 24th. All training dates will be held from 9 a.m. to 3 p.m. Volunteers do need to adhere to an application and selection process prior to becoming a CASA. However, community members who are interested in learning more about volunteering are encouraged to contact the office or visit the website. CASA stands for Court Appointed Special Advocates and serves as a nonprofit program recruiting, training and supervising community volunteers who advocate for abused, neglected and/or abandoned children who are dependents of the court, facing judicial proceedings and/or in the child welfare system. CASA volunteers are trained and then appointed by a judge to represent the best interest of the child. The CASA volunteer then spends time with the child, getting to know him or her while also gathering information from the child’s family, teachers, doctors, care-givers and others who might be involved in their lives. An In-Service Training will be offered to all volunteers Friday, February 1st. Volunteers wanting to participate in the different training dates offered should contact the office to confirm their attendance. Other interested community members are encouraged to submit their application to be considered as a CASA. Applications can be found online at www.neincasa.net or by call 260-636-6101. 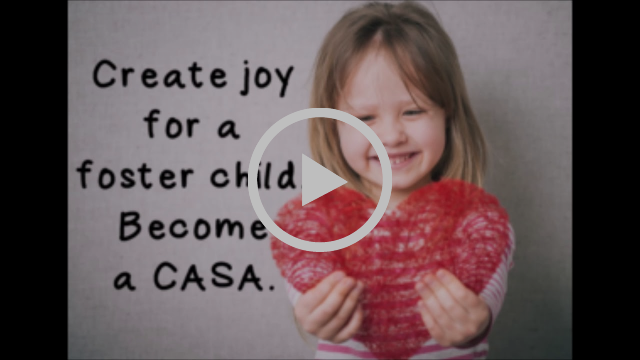 Recently Executive Director Kirby Cool and a group of volunteers came together to record a series of radio spots aimed at introducing CASA to listeners. We then put a few of them to video. Catch a few of the videos below and be sure to share them on your social media channels. It’s a new year and with the changing of the calendar comes some new radio clips to introduce the community to Northeastern Indiana CASA. These short blurbs about what we do and how we impact the lives of children in our area will help educate listeners and further our mission. As you listen to these quick 60-second spots, share them with others who you think might like to know more about who we are, what we do and what it might mean to volunteer. ALBION — After Thanksgiving meals and holiday shopping, Northeastern Indiana CASA invites community members to participate in Giving Tuesday by supporting the nonprofit in several ways - financially with a donation, volunteering your time or helping spread the mission of CASA by sharing some of our posts on Facebook. Those who are interested in joining Northeastern Indiana CASAs #GivingTuesday initiative can visit www.neincasa.net or call our office at 260-636-6101 . For more details about the #GivingTuesday movement, visit the #GivingTuesday website (www.givingtuesday.org), Facebook page (https://www.facebook.com/GivingTuesday) or follow @GivingTues and the #GivingTuesday hashtag on Twitter. Kirby Cool is pictured along side former executive director Kristi Bachman as Cool was introduced as the new executive director. Bachman retired after 13 years of service. ALBION — After 13 years of leadership, Northeastern Indiana CASA has a new executive director - Kirby Cool. Former Executive Director Kristi Bachman announced in August that she would retire at the beginning of November after 13 years of service. Cool was recently announced as Bachman’s successor and was formally introduced at the nonprofit’s annual volunteer appreciation dinner in October. Kirby Cool recently took over as the executive director for Northeastern Indiana CASA. “I don’t give up on troubled situations,” Cool said. “I’ve always been drawn to circumstances that need help and hope. I knew Kristi from working with CASA through the United Way, so it seemed like a good move for me." Cool joins the nonprofit with a wealth of help and experience behind her in the numerous volunteers, board members, staff and supporters. In the five counties Northeastern Indiana CASA serves, relationships have been forged with judges, law enforcement and court personnel, which will continue to serve the children represented by CASA volunteers as they navigate court and judicial proceedings. Bachman and Cool worked alongside each other for weeks leading up to Bachman’s last day. Doing so offered another layer of comfort for Cool. Cool and staff members are already planning a volunteer training session for early 2019. Interested community members that may want to consider volunteering should visit www.neincasa.net to complete an online application. 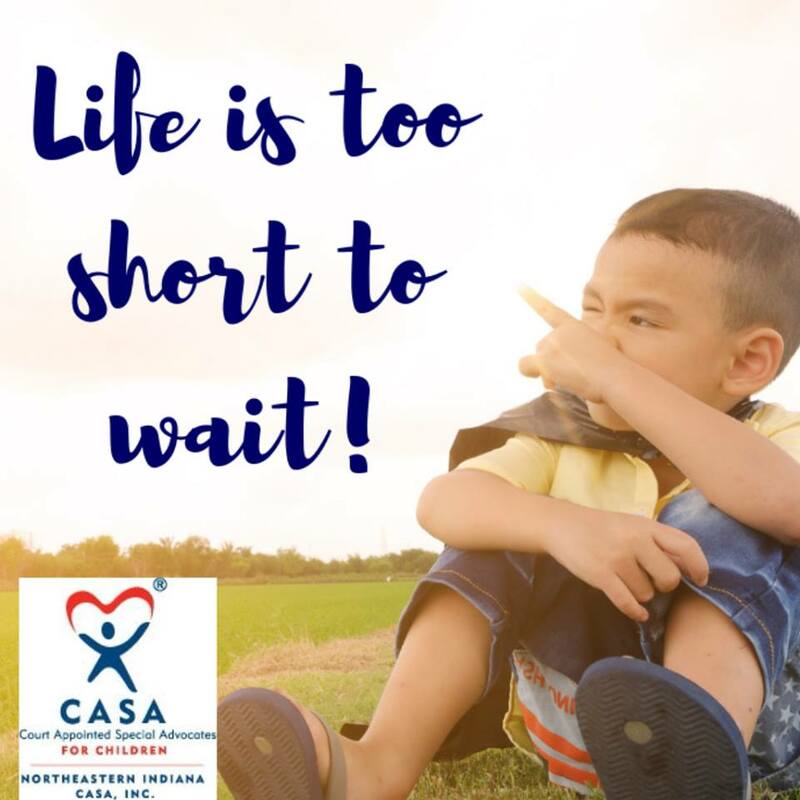 For more information about Northeastern Indiana CASA, visit the website or call 260-636-6101 or email casa@neincasa.net. Bonnie Schoppman, pictured center, has served Northeastern Indiana CASA as a volunteer for 25 years. She is pictured with Executive Director Kristi Bachman (left) and Steuben County Circuit Court Judge Allen Wheat. ALBION — If volunteers are the lifeblood of Northeastern Indiana CASA, then Bonnie Schoppman is the heart moving it ahead by example. With 25 years under her belt as a CASA, Schoppman has served well over 100 children. Northeastern Indiana CASA provides a voice for powerless children involved in judicial proceedings. Volunteers advocate for the child’s best interests and work to improve the child’s circumstances and quality of life. Although Schoppman serves Steuben County, she has also served in some of the other four counties Northeastern Indiana CASA covers - Noble, LaGrange, DeKalb and Whitley counties. And Schoppman isn’t read to slow down just yet. In her 25 years Schoppman says some things have changed, such as policies and procedures. However, the need still remains and is growing. Schoppman was first introduced to CASA while working at Lincoln Life. A co-worker was involved in the Allen County program and urged Schoppman to explore the volunteer opportunity. Bachman said this long-term volunteer sets a great example for other volunteers. Northeastern Indiana CASA served 498 children in 2017 and to date, 530 in 2018. There is a growing trend for CASAs needed in the area. Schoppman says she would like to encourage more community members to get involved and volunteer, and although she is passionate about CASA and its mission, she understands that the volunteer role isn’t for everyone. The next training session for volunteers is being planned for January 2019. To learn how you can get involved, visit www.neincasa.net. ALBION – It was 13 years in the making, Kristi Bachman’s legacy and impact as executive director of Northeastern Indiana CASA. Recently Bachman announced her retirement and will officially step down from her position at the beginning of November. Northeastern Indiana CASA serves five area counties, Noble, LaGrange, Steuben, DeKalb and Whitley, as a nonprofit aimed at advocating for children in the middle of judicial proceedings. When Bachman first joined the nonprofit, she was originally hired by the judges in those counties. During the annual appreciation banquet, volunteers and board members submitted their own sentiments, which were shared by board members Julie Jensen-Kelly and Margot Phillips. Bachman’s retirement plans were timed with her husband Paul’s retirement and the couple is looking forward to a time of relaxation and time with family. Kirby Cool, of Auburn, will be taking over the executive director position. Cool is coming to CASA after having served with the United Way of Whitley County. A snapshot from a past volunteer banquet, Bachman visits with some of her volunteers and shares a laugh with Bonnie Schoppman. Bachman, right, is pictured with her staff members at a recent conference. As Kristi Bachman gave her final remarks at the Annual Volunteer Appreciation Banquet, the crowd gave her a standing ovation and thunderous applause. Bachman is set to retire her position as executive director after 13 years with her last day being Nov. 5th. Bachman visit with some volunteers at the annual banquet, her last event before retiring. Kirby Cool, the incoming executive director, takes a moment to greet the crowd of volunteers after Bachman introduces her. Part of Bachman’s role allowed her to make numerous community connections, such as this one with the Auburn Moose Family Center. After 13 years, friendships were formed and relationships made with people touched by Bachman’s heart for CASA. Three volunteers were recognized at Northeastern Indiana CASA’s Annual Volunteer Appreciation Banquet for their years of service. Pictured, from left, are Executive Director Kristi Bachman, Bonnie Schoppman with 25 years of service, Katie Bowman with five years of service and Susan Hughes with five years of service. KENDALLVILLE— Each year Northeastern Indiana CASA hosts a banquet in appreciation of its volunteers. The night features food and entertainment as well as recognition for dedicated volunteers who have years of service. This year’s banquet had some added highlights. Recently, Executive Director Kristi Bachman announced her retirement after 13 years in the position. The banquet marked her last event with the nonprofit and she took the time to encourage volunteers to “push ahead” with the mission to advocate for children in the five counties it serves - Noble, LaGrange, DeKalb, Whitley and Steuben. Bachman offers some final remarks as she prepares to retire her position as executive director after 13 years. Pictured is Bachman (left) as she passes the torch to incoming executive director Kirby Cool (right). Bachman reported that 498 children were served in 2017 and to date, 530 in 2018. As part of the night’s recognition were three volunteers who have a total of 35 years of service between them. Both Susan Hughes and Katie Bowman of LaGrange County have each served as a volunteer for five years. Bonnie Schoppman was recognized for her 25 years of service. Schoppman currently serves Steuben County, but in her 25 years she has worked in several others. In addition to the recognition given, the incoming executive director was introduced. Kirby Cool, of Auburn, comes to Northeastern Indiana CASA from her previous position with the United Way of DeKalb County. The night’s guest speaker was Ted Westerhof who returned for a second year. Westerhof is the student and employee assistance coordinator for Bowen Center, and is certified in critical incident stress management. Given his expertise, it was no surprise that much of his speech centered around “self-care” and helping volunteers avoid the emotional weight that comes with such a position. Entertainment was provided by harpist Anna Hagen and food was provided by Bo Doogie’s. A large group of staff and volunteers attended from Northeastern Indiana CASA. Our staff, along with Executive Director Kristi Bachman, attended a special session on Friday. Events such as this provides ongoing training and support for our staff and volunteers. New volunteers attend a special training to equip them for their CASA role. This happens twice a year and our Fall training is taking place soon! Fill out an online application to join us! Recently, Northeastern Indiana Casa staff and volunteers gathered for a specialized training at the Kendallville Library. Topics covered during the day centered around what to do and what not to do as a CASA. The day featured a panel discussion which included area judges and a discussion on working a case study. Training is an important part of preparing a volunteer to be better equipped for their role. Community members who are interested in getting involved with Northeastern Indiana CASA should not feel as if previous experience is needed. Fall Training is happening soon and those who want to join as a volunteer should complete an application soon! Northeastern Indiana Casa Executive Director Kristi Bachman speaks to the group of volunteers gathered for a recent training. Volunteers came together for a recent training program to help learn more about the role they hold within the nonprofit organization. Training events breed conversation, support and continual learning for our volunteers. Pictured from Left to right is Noble County Circuit Court Judge Steve Hagen, Steuben Circuit Court Judge Allen Wheat, Whitley County Circuit Court Judge Matt Rentschler, and DeKalb Superior Court II Judge Monte Brown. Northeastern Indiana CASA Executive Director Kristi Bachman (pictured left) is pictured with Auburn Moose Family Center leaders who raised $7,000 for the nonprofit with a recent golf outing. Auburn Moose Family Center hosted a golf outing July 22nd at Garrett Country Club to benefit Northeastern Indiana CASA. Sixteen teams participated in the event and at the end of the day, $7,000 was raised for the nonprofit. Stan Surfus tees up a shot at the golf outing hosted to benefit Northeastern Indiana CASA. "As Director of a program that relies heavily on volunteerism, I am extremely aware of the significance of people who give of their time to help others," said Kristi Bachman, Executive Director for Northeastern Indiana CASA, a nonprofit advocating for children in Steuben, Lagrange, Dekalb, Noble and Whitley counties. "Your community is blessed to have so many generous people I have had the privilege to get to know at the Auburn Family Moose Center. On behalf of the children throughout Northeastern Indiana that will benefit from your efforts, we sincerely thank them for their generosity." David Young, Aaron Duzan, Paul Cherry, Tim Kochanski were the winners of the four-man Florida scramble. The event included a golf outing, lunch, and silent auction to benefit the program. The committee comprised of Scott and Cathy Pepple, Lonnie Fry, Dennis Carper, and Mack Short, worked for many months organizing, soliciting sponsors and teams, and many other responsibilities to put on a "wonderful" event. Other Moose members donated their time throughout the day as well. Judy Rensch has been a volunteer for Northeastern Indiana CASA for approximately four years after witnessing a little girl in a courtroom proceeding while Judy served as a juror. What started as an item on her bucket list became a reality four years ago. Judy Rensch was in a courtroom serving as a juror when she was moved to become an advocate for children. Northeastern Indiana CASA serves Noble, Lagrange, Dekalb, Steuben and Whitley counties by providing court appointed special advocates (CASA) for children who are facing judicial proceedings. These adult volunteers work with children and their families to assess the child’s situation and offer valuable insights and evaluations for judges and judicial authorities. Volunteers can expect to complete an application before attending training sessions before officially taking up the role as a CASA. Training equips volunteers for cases by helping them know how to interact with court reports and at hearings as well as how to conduct interviews with teachers, family members, and other individuals who have encounters with the child. Although some situations end with the child being removed from their home due to court decisions, there are some occasions where parents meet court guidelines in order to have their children returned. Judy said this is something she celebrates. Unfortunately, statistics have shown that children who grow up in volatile homes are more likely to create a volatile home as an adult, perpetuating the destructive, unstable environment they have come to know. This can create a cyclical pattern from generation to generation. However, Judy said she sees CASAs as a “beacon of hope” that can turn the tide for the child. One of the challenges for a child in these types of cases is the revolving door of service providers. While counselors change and even healthcare providers are different, a CASA is sometimes the only constant face in the middle of a turbulent time for a child. Judy went on to say that her influence in the courtroom is vital to the child’s future. As she builds a rapport with the child and learns more about who and what influences her case, she sees the importance of CASAs who offer feedback to the judges. Understanding the importance of a CASA’s role would seem to imply days of paperwork and many long hours in the courtroom. However, Judy said her experience has been more manageable than she expected. With interviews and visits she can schedule on her own time, Judy is able to spend about four to six hours a month on her given case. Northeastern Indiana CASA's annual fundraiser event was held April 20th at Sylvan Cellars Event Center featuring tasting stations, drinks and silent auction items. The event raised $52,500 for the nonprofit. ROME CITY -- It's an annual event supporters are sure not to miss. Complete with food, drinks and silent auction items aplenty, CASA Palooza is consistently well attended and this year's event proved to be another "success." The event was held April 20th at Sylvan Cellars Event Center in Rome City, and the night closed with more than $52,500 raised for Northeastern Indiana CASA. "It's an important event since this is our only fundraiser," said Executive Director Kristi Bachman. "Each year there's more awareness and more support for our mission. It's great to see it growing." Caterers, restaurants, and other eateries came together to provide tasting stations that varied from Asian fusion cuisine to prime rib to bison meatballs. As crowds tasted and sipped their way through the night, silent auction items were on display to tempt the purse strings. "It's a fun night with something for everyone," said Bachman. "So many great people came together to make this a success. Our staff, board members, and volunteers go above and beyond. Some of our sponsors are loyal supporters and there are some restaurants who come out year after year to be part of this event. It means a lot." Northeastern Indiana CASA provides court-appointed advocates for children involved in judicial proceedings. Community members from DeKalb, Lagrange, Noble, Steuben and Whitley counties volunteer their time to be an advocate, working with children to be a voice for them and their best interests in the courtroom. "The message tonight is simple," said Bachman during her remarks at the event. "It’s about home. The place everyone here will go to at the end of this day. The place we know where to go to at the end of the day. One former CASA child said it like this, 'Home means the place where you don’t want to leave.' In Spanish the word CASA means home. Our goal is to help ensure every child has a safe, permanent home. Your support helps us help these kids get there." Approximately 350 children are already being served by the nonprofit. However, there are 60 additional children waiting for a CASA. Volunteers are needed and can apply online or by contacting the office. A volunteer training is provided twice a year so volunteers can be best equipped for their role. "Eight-six percent of our caseload is being served," Bachman said. "The good news is this is almost a twenty percent increase from two years ago. Progress is being made. Every year at this event we focus on children our advocates have helped," said Bachman. 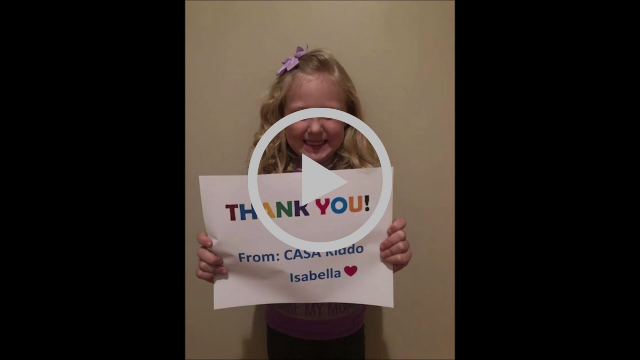 "This year I wanted to share some of the children’s stories who don't currently have a CASA." Bachman referred to a few specific situations such as a five-year-old child in foster care because the mother is "unable to stop using drugs" and the father is "unknown." Currently, there is a family of four children who are temporarily living with their grandparents, waiting for an advocate, while their parents are in prison. Bachman also mentioned a baby, born just last week addicted to opiates. Photos from the event can be found at www.neincasa.net. Visit the website to learn more about volunteer opportunities and to complete an online application. ALBION – During National Child Abuse Prevention Month in April, Northeastern Indiana CASA challenges residents in the area to stand against child abuse and take action to support children who have been abused or neglected. At any given time, there are hundreds of children in foster care in the counties we serve - DeKalb, Lagrange, Whitley, Steuben and Noble counties. These children come into the child welfare system through no fault of their own. Throughout the month of April, Northeastern Indiana CASA is calling on members of the community to help our program serve more of our area's most vulnerable children. Through social media posts and community involvement, our message is clear - abuse and neglect are not acceptable in our area and we stand together to raise a voice for children who need it. Without intervention, the odds are stacked against children in foster care. A child with a CASA volunteer, however, spends 20 percent less time in foster care, on average, compared to a child without these volunteers. Studies show children with a CASA volunteer receive more services that are critical to their well-being and are four times more likely to find a permanent home. Northeastern Indiana CASA is a member of the National Court Appointed Special Advocate Association (National CASA), a nationwide network of programs in nearly 1,000 communities. 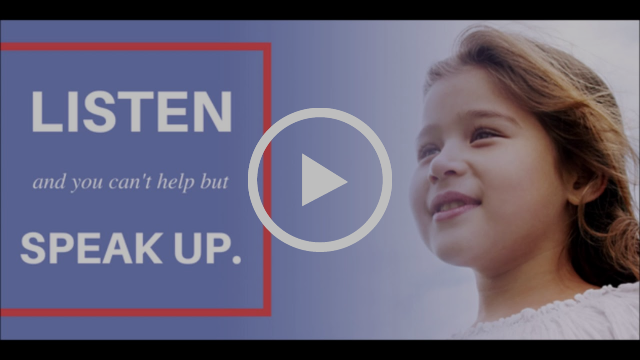 At the heart of the movement are nearly 87,000 highly trained volunteers who advocate for the best interests of more than 280,000 of America’s children who have been abused or neglected. In our area, there are volunteer advocates fighting for the best interests of children, but more children need the care and support of a CASA volunteer. CASA Palooza 2018 is slated for April 20th at Sylvan Cellars in Rome City. This event is Northeastern Indiana CASA's annual fundraiser that features tasting stations with food and drinks from area caterers and restaurants. There is also a silent auction with proceeds from the event directly benefiting Northeastern Indiana CASA. "Last year, with the support and help of generous community members, sponsors, volunteers and business, we raised $48,000," said Executive Director Kristi Bachman. "But we are excited to exceed this number this year. Already we have several business and community sponsors." This nonprofit organization serves Dekalb, Whitley, Lagrange, Steuben and Noble counties with a focus on advocating for children involved in judicial proceedings. 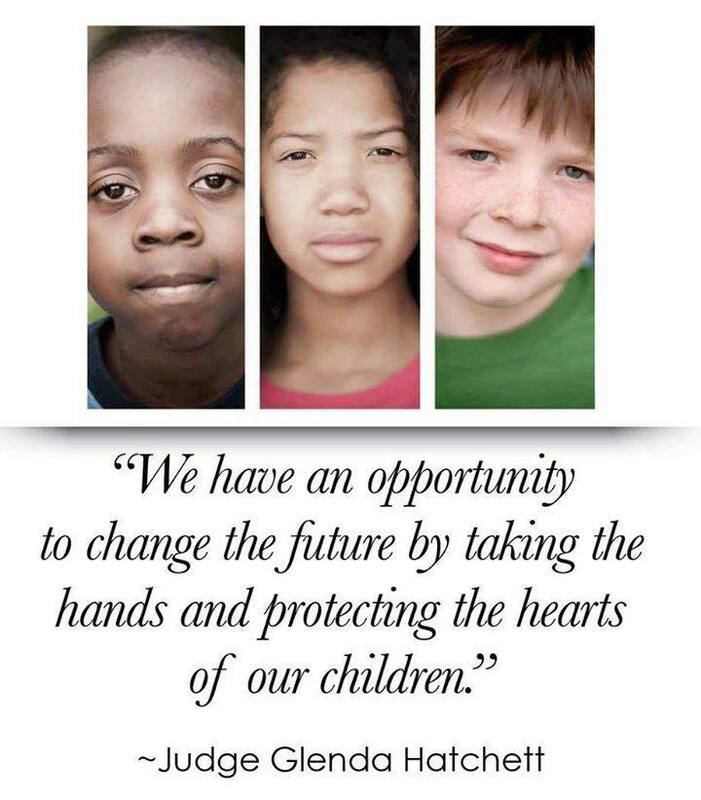 Northeastern Indiana CASA supports and promotes court-appointed volunteer advocacy so abused or neglected children can be safe, have a permanent home and the opportunity to thrive. "Our staff and volunteers all work to provide a voice for children in our area," Bachman said. "We advocate for their best interests and strive to improve their circumstances and quality of life. What we do has a long-lasting impact on the children we serve, which makes events like CASA Palooza so important in order for us to keep our mission empowered to make that difference." Tickets to CASA Palooza are now available online. Get more information on the event at www.neincasa.net. In addition to having a caseload of more than 15 cases at one time, Myrlee also offers support and guidance to the organization's group of volunteers. However, it’s the facets of Mylee’s job that won’t be identified on a resume that makes her efforts far-reaching. February marks the 10-year anniversary for Myrlee Gray and her dedication to Northeastern Indiana CASA. “I first became involved with a 14-year-old boy whose parents’ had their rights terminated five years prior to my assignment. There were behavioral concerns and his mother struggled to control her son,” Myrlee said. She remembers the boy telling her that he had lived in different institutions since he was nine years old. He was not told about the decision to terminate parental rights and his behavior reflected a host of emotions. Myrlee is pictured, center in front row, with other CASA staff and volunteers at a recent conference. Myrlee said the boy continued this behavior for the next three years, all in hopes to return to his mother, but again not knowing or understanding what all had transpired to separate the boy and his mom. This situation was not acceptable to Myrlee. Pictured right, Myrlee works with other CASA volunteers to pass out appreciation gifts at a recent banquet honoring volunteers, board members and staff. At age 17 the boy was placed in a juvenile detention center, and at age 18 he was released. He located his mother and was reunited with her, but Myrlee says the “old behaviors” continued. Now the boy, who has turned into an adult, is in prison. It would be easy for case managers and volunteers to deem this case a “failure,” but Myrlee continues to hold out hope. And that’s what Myrlee does day in and day out. She has spent her 10 years matching children to volunteers, attending court hearings, participating in family preservation programs and monthly child protection team meetings. She is no doubt motivated by that nine-year-old boy, and numerous other children, who need someone to advocate for their best interests and strive to improve their circumstances and quality of life. Before her role with Northeastern Indiana CASA, Myrlee worked as a nurse. The experience afforded her an inside view of the need that was in her community. In addition to the support in the courtroom, Myrlee, and the team of staff and volunteers, keep abreast of services and resources available in the community that might help families and children in need. Recent reports have listed Indiana in the top five states that have the highest number of children in custody. Many of these children, more than half, were removed due to drug and alcohol abuse. “Addiction has led to homelessness. Kids go hungry, they can witness domestic violence, and miss school,” Myrlee says. “These children can become neglected or abused while caregivers are feeding their addictions. When caregivers are arrested, they leave these children with no one to take care of them, so they are placed in foster care. Through her 10 years of experience, Myrlee says that while the mission of CASA is the same, judges, attorneys and child service organizations have become more aware of the positive influence CASA staff and volunteers can have in the life of the children they serve. Seven volunteers recently completed Northeastern Indiana CASA's Fall Training. Twice a year, volunteers gather for training in order to learn how to better advocate for the children they serve. "This is a valuable training for all of our volunteers," said Executive Director Kristi Bachman. "By coming together to learn, we can support each other in our mission to speak up for children in our area. The training also gives our volunteers confidence to do their best in all their efforts." Becoming a volunteer takes a few steps, one being an application that needs to be completed. David Lowe recently completed his volunteer training in order to join the ranks of other community members who serve as CASAs for Northeastern Indiana CASA. David was sworn into his role by Judge Rentschler in Whitley County. David is a facilitator supervisor at 80/20 by day and wanted to do something to help children.